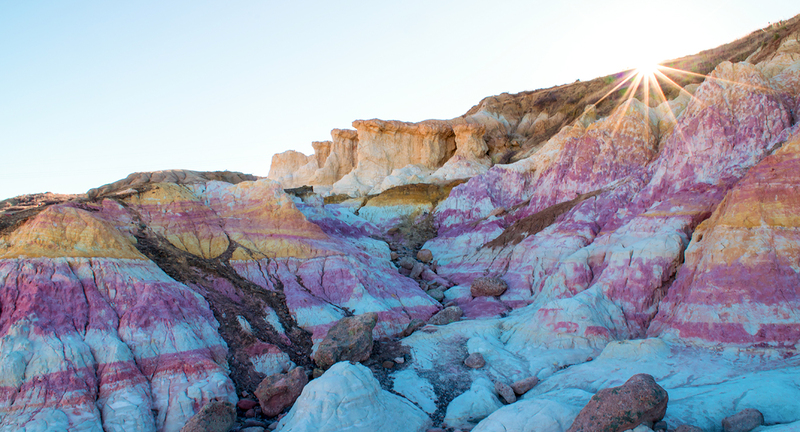 The Paint Mines Interpretive Park is one of El Paso County’s most unique open spaces. The Paint Mines are named for their colorful clays that were collected by American Indians to make paint. Brightly colored bands, caused by oxidized iron compounds, are found in varying amounts throughout the many different layers of clay. The Paint Mines Interpretive Park is located in the northeast section of the County near Calhan with approximately 750 acres. The paint mines have evidence of human life as far back as 9,000 years ago. The park features fantastic geological formations including spires and hoodoos that form through erosive action that creates incised gullies and exposed layers of selenite clay and jasper. The park includes a restroom facility, four miles of trails, interpretive signage, and many natural wonders. The Paint Mines restroom is located in the main entrance parking area and is open year round. Take Hwy 24 east from Colorado Springs to Calhan, turn south on Yoder Road/Calhan Highway, turn east on Paint Mines Road and look for the designated parking area. Stay on designated trails at all times. Climbing and/or scrambling on Paint Mine formations is prohibited. Entering the Paint Mine formations is prohibited. All plants, wildlife, rocks, minerals, and historic artifacts within park boundaries are protected by law. Do not remove, destroy, or disturb any of these features. Pets, horses, and bicycles of any kind are prohibited. Avoid gulches and gullies during wet weather. No pets, no horses, no bikes. The Paint Mines Interpretive Park is a beautiful location for all types of photography. Photographers are welcome to use the park for non-commercial portrait and landscape photography. These rules are in place to preserve the natural beauty of the park and for the safety of visitors. Commercial photographers and videographers need a permit. Contact the Parks Office for more information at (719) 520-7529.